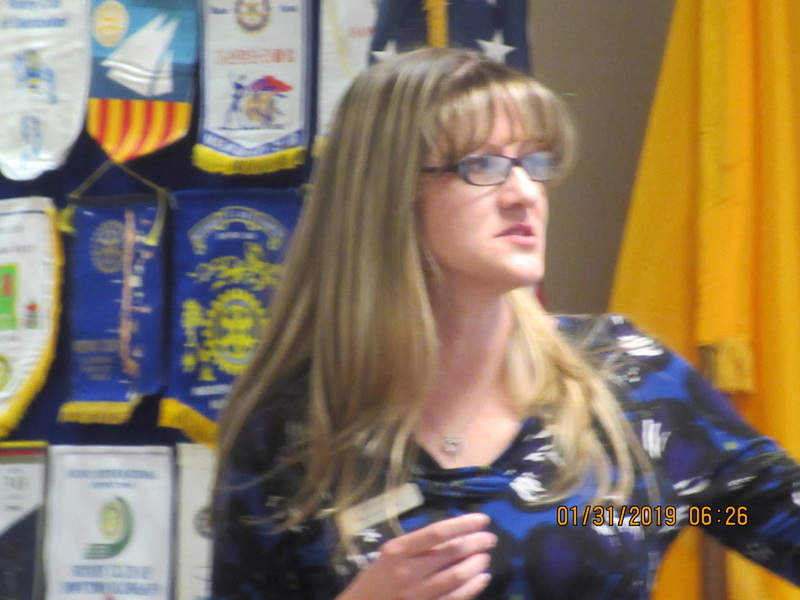 April Spaulding, from Abrazo Family Support Services Speaking on "Autism-What is it"
Thursday's Regular Meeting on January 31, 2019 featured April Spaulding from Abrazo Family Support Services who spoke on "Autism-What is it" It was an excellent presentation on a subject most Rotarians know little about. April told us that Autism is a Spectrum Disorder and described the various symptoms. She said it is often hard to diagnose. Autistic children need a lot of support services including Early Intervention, Occupational Therapy, Speech Therapy and Counseling. Abrazo provides those services as well as Recreational Respite which helps Autistic Children integrate into the community. 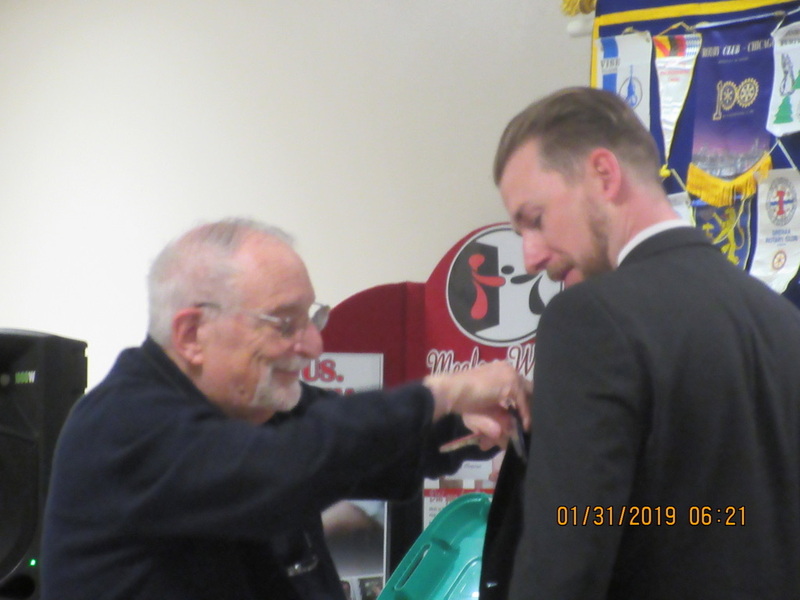 Barrie Segall, Membership Chair presents Nic Baker with his Blue Badge at the January 31 Meeting. Tomorrow at 5:15 the Satellite Group will hold their meeting at Nexus Brewery. Please attend and share Memories of today's Super Bowl Game. Meredith Eisenberg will have an interesting program as well. The Regular Meeting on February 7 will feature our own Membership Chair Barrie Segall speaking on "An Exercise in Membership" This will be a valuable meeting as we try to grow and retain membership. On February 12 at 5:30 the Governors Charity Ball General Meeting will be held at Nexus Brewery. Please try to attend as Governors Charity ball is getting closer and we need sponsors and auction items. On February 14, 2019, Valentines Day, the Regular Club Meeting will be an opportunity for Members to bring their spouse or significant other as a guest to the meeting. Title of Meeting is "Love is Blind". Please sign up if you plan to come and bring a guest. Meeting will be at Meals on Wheels and we really need to know how many guests you will have. To register click on the event in the Event Calendar on the Home Page of Club Runner.